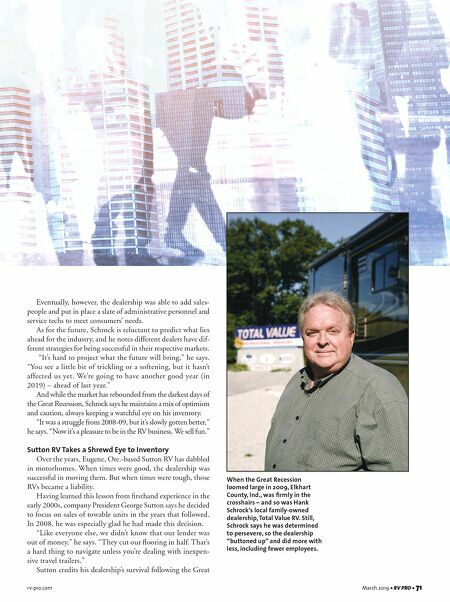 70 • RV PRO • March 2019 rv-pro.com D E A L E R S Dealers share how the Great Recession transformed their businesses, what they did to survive, and how they benefited from the decisions they made. 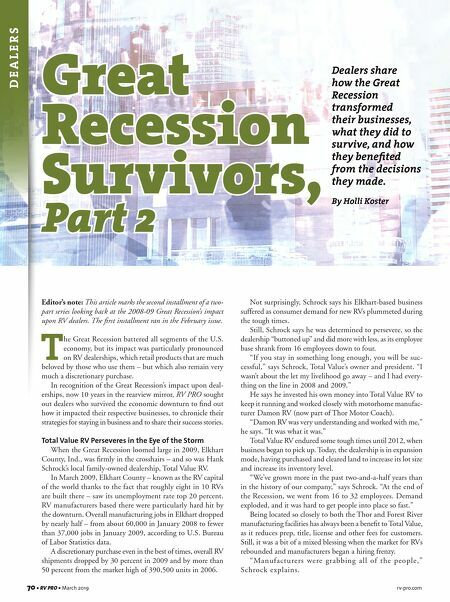 By Holli Koster Great Recession Survivors, Part 2 Editor's note: This article marks the second installment of a two- part series looking back at the 2008-09 Great Recession's impact upon RV dealers. The first installment ran in the February issue. T he Great Recession battered all segments of the U.S. economy, but its impact was particularly pronounced on RV dealerships, which retail products that are much beloved by those who use them – but which also remain very much a discretionary purchase. In recognition of the Great Recession's impact upon deal- erships, now 10 years in the rearview mirror, RV PRO sought out dealers who survived the economic downturn to find out how it impacted their respective businesses, to chronicle their strategies for staying in business and to share their success stories. Total Value RV Perseveres in the Eye of the Storm When the Great Recession loomed large in 2009, Elkhart County, Ind., was firmly in the crosshairs – and so was Hank Schrock's local family-owned dealership, Total Value RV. In March 2009, Elkhart County – known as the RV capital of the world thanks to the fact that roughly eight in 10 RVs are built there – saw its unemployment rate top 20 percent. RV manufacturers based there were particularly hard hit by the downturn. Overall manufacturing jobs in Elkhart dropped by nearly half – from about 60,000 in January 2008 to fewer than 37,000 jobs in January 2009, according to U.S. Bureau of Labor Statistics data. A discretionary purchase even in the best of times, overall RV shipments dropped by 30 percent in 2009 and by more than 50 percent from the market high of 390,500 units in 2006. Not surprisingly, Schrock says his Elkhart-based business suffered as consumer demand for new RVs plummeted during the tough times. Still, Schrock says he was determined to persevere, so the dealership "buttoned up" and did more with less, as its employee base shrank from 16 employees down to four. "If you stay in something long enough, you will be suc- cessful," says Schrock, Total Value's owner and president. "I wasn't about the let my livelihood go away – and I had every- thing on the line in 2008 and 2009." He says he invested his own money into Total Value RV to keep it running and worked closely with motorhome manufac- turer Damon RV (now part of Thor Motor Coach). "Damon RV was very understanding and worked with me," he says. "It was what it was." Total Value RV endured some tough times until 2012, when business began to pick up. Today, the dealership is in expansion mode, having purchased and cleared land to increase its lot size and increase its inventory level. "We've grown more in the past two-and-a-half years than in the history of our company," says Schrock. "At the end of the Recession, we went from 16 to 32 employees. Demand exploded, and it was hard to get people into place so fast." Being located so closely to both the Thor and Forest River manufacturing facilities has always been a benefit to Total Value, as it reduces prep, title, license and other fees for customers. Still, it was a bit of a mixed blessing when the market for RVs rebounded and manufacturers began a hiring frenzy. "Manufacturers were grabbing all of the people," Schrock explains.